Groundhog Day! | Look Out Scarborough! 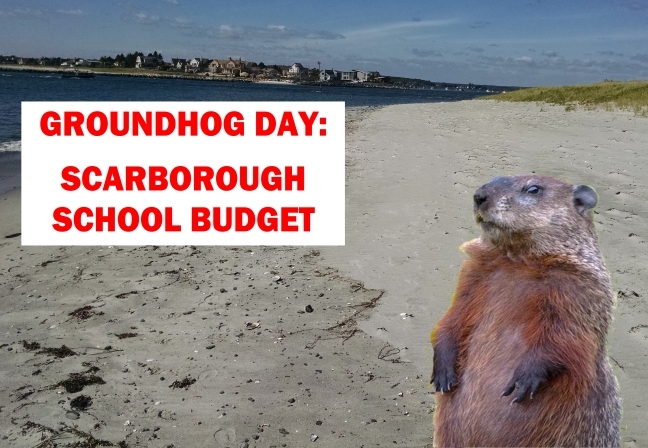 In Scarborough we have our own unique version of groundhog day: if the groundhog sees an increase of more than 5% in taxpayer funding of the schools at the first reading of the budget (April 6 this year), then the Town is plunged into several months of acrimonious debate and multiple budget referendums. Early indications are that we’re in for another tumultuous budget season. To start things off, the education aid we’re going to receive from the State is down about a million dollars from last year, primarily because (1) we’re a relatively rich town compared to the rest of the State and (2) enrollment in the schools is down. For more details, please check out Scarborough Budget Meltdown Begins in the March 3 issue of The Current. Then there will be a percent or two of “investment” in new programs that are “mission critical.” And before you know it, you, dear taxpayer, will be expected to pick up an increase in school funding approaching double digits. It’s presented so you can actually understand what’s happening, including enrollment and full-time-equivalent employee histories. Their total expense increase is less than 1%! Their salaries and benefits increase is less than 1%! Who would have thought Portland would provide budgetary inspiration? Speaking of budgets, a new contract with Scarborough’s teachers’ union is scheduled to go into effect on September 1, 2016, less than six months from now. That contract probably accounts for 40% or more of the school department’s entire expense budget. And if it’s a three-year contract like the current one, it will lock in those expense increases through Fiscal 2019. 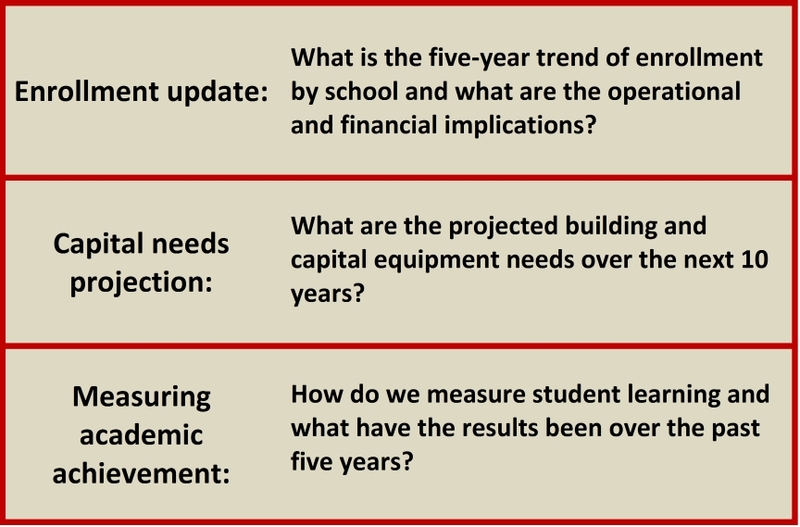 It is arguably the most important element in the schools’ financial performance. Huh? Well, that clears up things, doesn’t it? We fully understand that the details of contract negotiations are confidential in accordance with State law. But perhaps things are being carried a bit too far here. Have we even started negotiations with the teachers’ union yet? 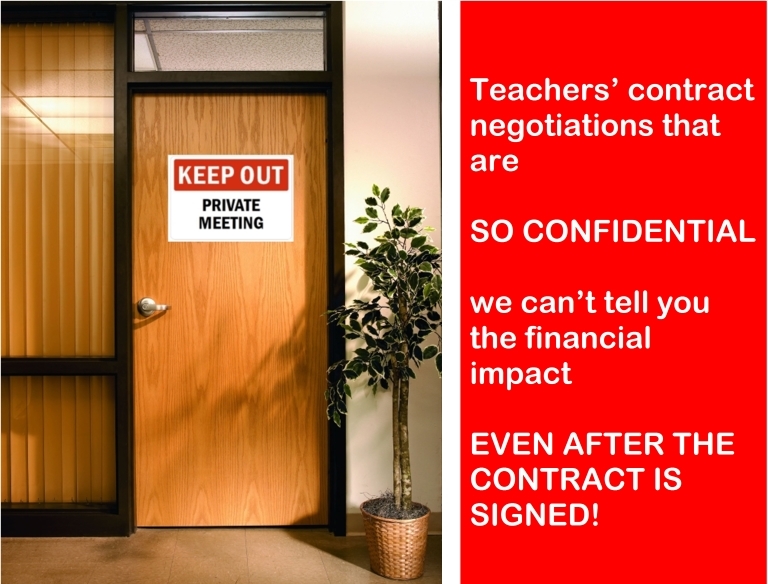 Would it be too much to ask for taxpayers to get some assurance that our interests are being looked out for in the teachers’ contract negotiations? Just in time for the budget season, the School Board has launched a newsletter. As you know, we at LookOutScarborough are huge fans of good communications. So we are pleased to welcome this new vehicle, and we encourage our faithful readers to sign up for the newsletter. Here’s the sign-up link. 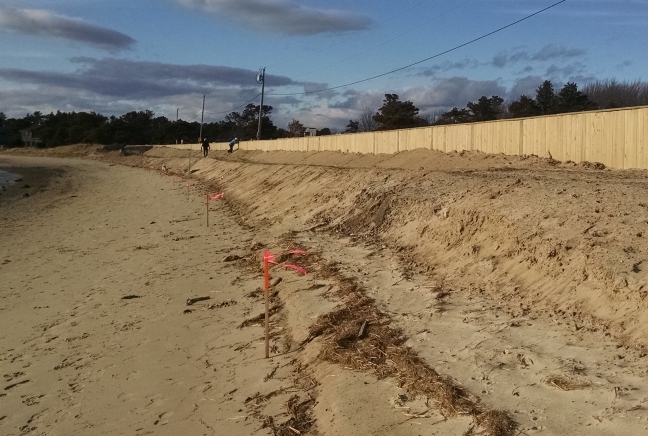 The Golf Course Protection and Dune Reinforcement Project at North Ferry Beach is now complete. (There’s still some equipment in the parking lot, but once the jobsite Porta-Potty has been removed, we consider the job complete.) While the project wasn’t nearly as exciting as the Western Beach “renourishment” of the previous two winters, it was nevertheless entertaining in its own way. 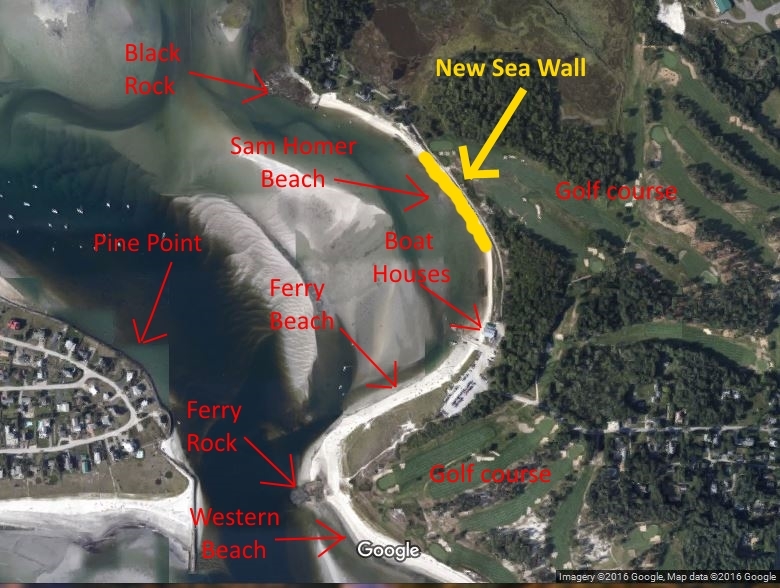 With the completion of the project – essentially replacing 750 feet of beach dunes with a hardened sea wall – the next generation of Prouts Neck Country Club golfers can breathe a sigh of relief. That pesky Atlantic Ocean has once again been thwarted in its attempt to reduce the golf course to pitch-and-putt status. Here’s what the dunes looked like on North Ferry Beach (also known as Sam Homer Beach, after Winslow Homer’s beloved terrier, Sam) before the golf course project began. The white objects between the water and the dunes are sand-filled plastic bags, the remnants of the previous attempt by PNCC to preserve the golf course. The project involved vertically inserting 20’ fiberglass slats about 8 to 10’ below sea level and then placing 12” wide wooden planks in front of them. Then sand was imported to recreate a dune-like appearance. It will all be topped off with plantings of dune grass. 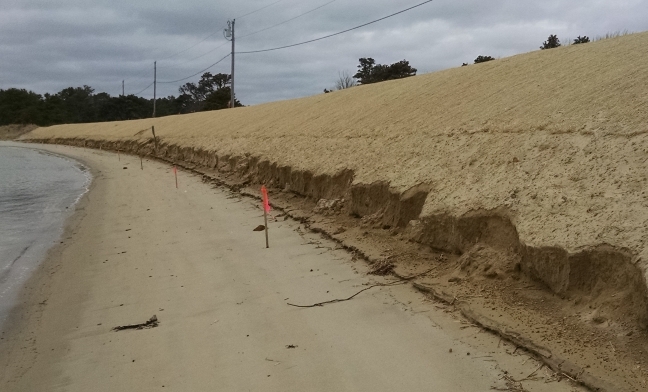 Here are a couple views of the fiberglass slats that were inserted in trenches deep into the existing dune structure. After the fiberglass slats went in, the wooden planks were added in front of them as seen below. Then more sand was imported and piled in front of the wall. The final result is shown below. This picture was taken within a few days of the final manicuring of the new dunes. 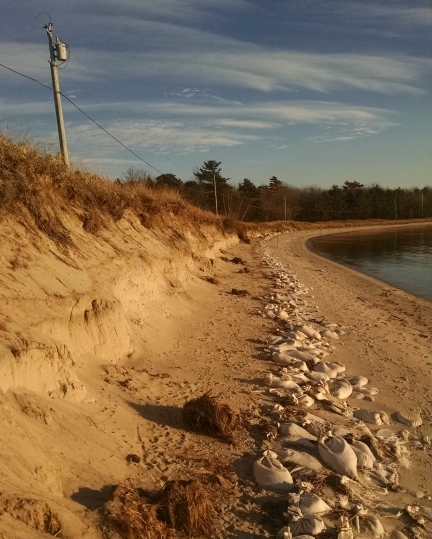 Note that there has already been significant erosion at the tidal edge of the new “dune.” This was without any storm action or particularly high tide. Just wait until a couple of southwesterly storms slam into it… those wooden planks will be exposed in no time and the sea wall component of this project will be very apparent. Two aspects of this project intrigued us. First, the lack of any public discussion about it. True, the golf course is private property and, as far as we know, the project was entirely funded by the Prouts Neck Association. But still. Isn’t Ferry Beach still considered “essential habitat” for the mightily endangered piping plover? Many of you may recall the considerable brouhaha that accompanied the Western Beach reconstruction project three years ago. Audubon, the Maine Department of Inland Fisheries and Wildlife and the U.S. Fish and Wildlife Service were all up in arms in the name of protecting the little rascals. And yet here, not a peep has been heard as a fragile ecosystem has literally been bulldozed, heavily reinforced and permanently altered. Strange how that works. We’re also interested to see how the engineering for this project works out. 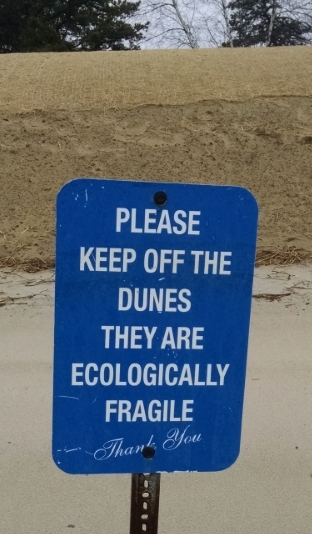 Sand dunes on a beach are there for a purpose. They come and go over time. They’re part of the plan. So we’ll enjoy watching just what happens to the new sea wall over the next few years. Unintended consequences are one of our favorite things! A view from the top of the new sea wall. Black Rock Road is at the left. 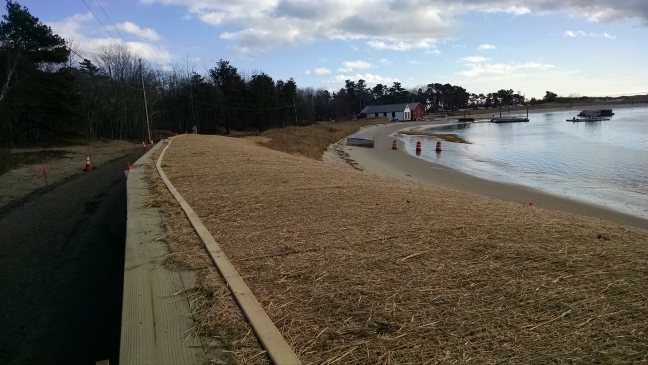 Speaking of beaches, the Town Council has once again waded into a prickly land controversy at Pine Point. 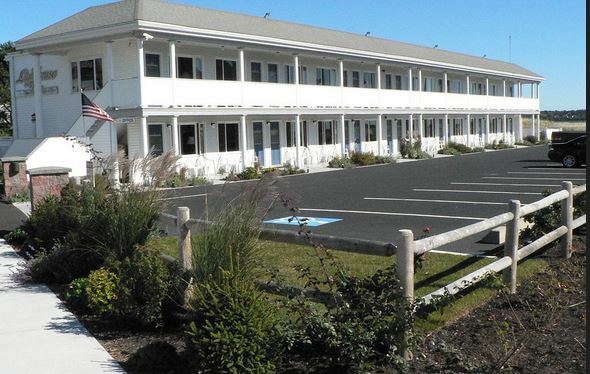 Yet another beachfront landowner is angling for a piece of Town-owned property. After the public relations disaster of the Lighthouse Motel land swap and the vigorous opposition to the proposed Wellehan land swap, why the current proposal is even in front of the Council astounds us. For a summary of the latest controversy, please see the article in The Current. Stay tuned for more developments. That’s it for now, friends. We hope to get back on a more timely schedule as the budget is rolled out. As always, thank you for reading, commenting and sharing! This entry was posted in Uncategorized on March 15, 2016 by Site Author.